Customisable retro chic with modern stability and versatile, great tones. Bridges Fender and Gibson/Epiphone tones nicely. Fralin P-90s are excellent pickups. Relic'ing makes for a very playable guitar. We'd swap the volume pots around. Scratchplate colour. Price. Launched earlier this year at the NAMM show, the ML6 is the latest addition to the Pennsylvania luthier Dennis Fano's Alt de Facto range. Fano says the ML6 was "discovered on the road somewhere between Kalamazoo and Fullerton", representing "the missing link between the working man's slab guitar from the 50s and the refined contours of an early 60s SG/LP." Fender and Gibson influences aside, the ML6's symmetrical double-cutaway outline is also reminiscent of the Epiphone Wilshire circa 1959 to '62 and it's a resemblance that's given further credence here by the presence of a pair of P-90s, a tune-o-matic bridge and stud tailpiece. "Our absolute favourite Fano necks are those that have had much of the lacquer removed to simulate heavy play wear"
As ever, Fano's relationship with the past is a pragmatic one. The bridge and tailpiece are contemporary TonePros locking units while the guitar's fingerboard has an on-trend 254 to 406mm compound radius that, in combination with the set neck join (which looks slight but feels robust enough) and generous cutaways, makes for a highly playable experience even in the highest registers. The guitar's 22 neatly installed frets are quoted in the official spec as "Jescar 6105", which, given that 6105 is Dunlop nomenclature, means that the fretwire is most likely Jescar 55090, which shares the 6105-gauge wire's 2.29mm width and 1.4mm crown height. It's the same nickel-silver alloy wire found on Gibson USA instruments and as such will make for a familiar ride for most players, as will the late-50s 'roundback' neck shape that fattens out to 24.6mm at the 12th fret. It's reassuringly chunky in the palm rather than being a monster. Our ML6 features a swamp ash body - the typically pronounced grain pattern of which is nicely visible through the nitrocellulose Mary Kaye White finish - with a glued-in maple neck. The total weight is a light 2.84kg that balances nicely when strapped on and doesn't suffer from neck dive. The combination of ash and maple is much more common on bolt-on designs but if it doesn't suit then there are numerous custom options, of which the swamp ash here is one. Mahogany and korina bodies and necks are also available for a premium. The base model is £2,449 and comes with an unbound fingerboard, dot inlays and an alder body - the swamp ash, bound fingerboard and trapezoid inlays here account for a significant proportion of the extra 300 notes. Although the spec sheet lists the level of finish distress on display here as "extra light", in reality the ageing seems closer to Fano's definition of "light" distress given the presence of dings, wear and light hardware ageing. The gloss nitrocellulose on the back of the neck remains intact; our absolute favourite Fano necks are those that have had much of the lacquer removed to simulate heavy play wear, such as that of the mouth-watering RB6 Thinline, but there's definitely still an old, lived-in feel here that's instantly appealing. Though artificial ageing is still an issue that gets some guitarists more than a little het up, we're of the mind that it's a finish option that, aside from any aesthetic concerns, has huge playability benefits when done thoughtfully. In any case, Fano will make you a clean ML6 if you so desire, so the choice lies firmly with the buyer. When it comes to the pickups that he selects for his instruments, Dennis Fano has very good taste indeed. Options for the ML6 include TV Jones, Lollar humbuckers and single coils and the Fralin P-90s installed here. "Straight off the bat, this ML6 screams Live At Leeds through our revved-up tweed combo"
Straight off the bat, this ML6 screams Live At Leeds through our revved-up tweed combo. Although there's a little less midrange push than you'd expect from an all- mahogany 50s or 60s Gibson, there's no shortage of raunch for vintage R&B, Brit-rock and Americana. Step on a drive pedal or two at volume and it's easy to summon musical feedback, but happily proceedings can get wild without collapsing into a mess of unwanted microphony. This is a guitar you want to gig and no mistake - our only minor gripe in use is that we'd prefer it if the volume pots were swapped around. For our money, it would feel more natural for the bridge potentiometer to be the closest control to the tailpiece. Clean things up and a quality pair of P-90s in a well-built chassis again proves to be immensely versatile - the swamp ash and maple combination helping the ML6 cross the border into Fender country with a slinky, slippery array of neck pickup tones. Flip over to the slightly hotter bridge unit and you get a little extra hair for rootsy snap and twang, while the twin-pickup mix is light and funky. 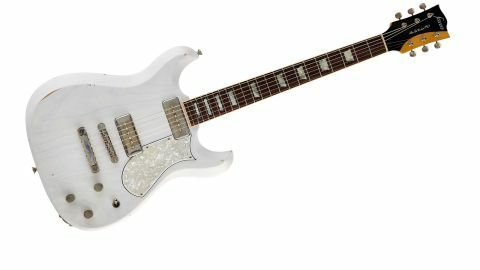 Initially, we were a little sceptical of the ML6's ability to deliver on Fano's 'missing link' promise as the instrument is steeped so heavily in Gibson and Epiphone styling cues, especially in this twin-P-90 and hardtail configuration. But aside from the bridge volume control position and the scratchplate colour - we'd take black over pearloid every time - everything else here is on the money, and playing time really does sees both sides of the ML6's sonic personality emerge. Mid-rich dirt brings out the SG/Les Paul Special leanings of the instrument, while cleanliness and spring reverb ushers a little southern Californian flavour into this fine blend. It isn't cheap, of course, but the quality of build and tone on offer from Fano is consistent with Team Built Fender Custom Shop and Gibson Custom instruments that are similarly priced in store, while the sheer number of options on offer allows you to tailor the instrument to your specific requirements.